Thailand’s last public execution took place just around the corner from the Sine office. That was in, Wat Phasee, on my birthday, 19th August, but a good few years before my time, in 1919. The victim was called Boonpeng Heep Lek and nineteen was clearly not a lucky n umber for him. There was a strict procedure for execution. First, the prisoner would be whipped for three rounds with thirty strokes for each round. On the way to the place of execution, he would be punished with ‘the five instruments of restraint’ which were a leg chain, waist chain, neck chain, handcuffs and hard wooden stocks. At the place of execution, he would have to sit with both legs stretched out in front of him and his body was fastened to a wooden cross. His ears and mouth would then be filled with clay and the base of his neck was also marked with clay, the target area for the swordsman I suppose. Filling his ears and mouth with clay may have been to keep his spirit in, I don’t really know. An executioner would then perform an elaborate ritualistic dance with his sword in front of the condemned man until it was believed that the prisoner’s mind was calm. Calm? How could anybody possibly have a calm mind in such circumstances? At that point, a second executioner would use a sword to behead him from behind. I have seen some old, grainy photographs of that last beheading and they are not a pretty sight. After execution, the feet were cut off to remove the leg chain. Then his body was chopped into pieces and given to the vultures and crows. Finally, his head was impaled on a sharpened wooden pole and displayed for all to see. And now, Boonpeng Heep Lek has his own shrine in the temple grounds with a steady stream of worshipers. People come here when they are wanting some good luck which strikes me as rather odd because poor old Boonpeng certainly didn’t have much luck in his life. And no, I don’t know what his crime was. Wat Phasee itself, which dates back to the 1840s, is a lovely and busy local temple with a very unusual stupa, the only one like it I have seen. 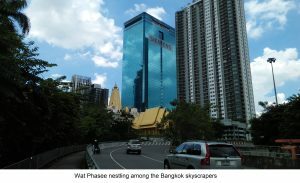 In those days, it was right on the outskirts of Bangkok but now I would call it city centre. There was also a cemetery here for any remaining bits of executed prisoners after the vultures had finished but part of that land is now a school and the other part is monks’ housing. I wonder if the students have any idea of the history of that piece of land. The temple itself is, in my view, well worth visiting but I don’t think this is mentioned in any of the guidebooks. As a point of information, it is on Ekkemai Soi twenty three.